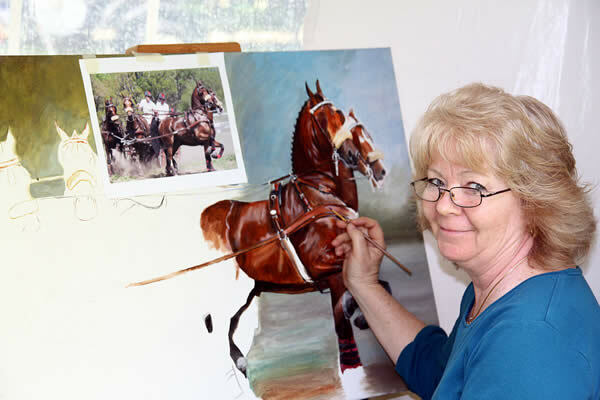 Equestrian artist Moe Hahn works on a painting of the combined driving horses that are part of Chester Weber’s famous and award-winning four-in-hand team. Ocala, FL (April 6, 2010) – Equestrian artist Moe Hahn has captured in action the beautiful bay horses that make up eight-time USEF National Four-In-Hand Combined Driving Champion Chester Weber’s team. Hahn, who lives in Ocala, is a well-known artist who displays her work at the Ocala Breeders’ Feed & Supply Stores in Ocala, Florida.